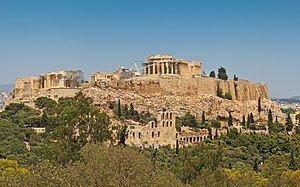 The Acropolis o Athens (Auncient Greek: Ἀκρόπολις; Greek: Ακρόπολη Αθηνών Akrópoli Athinón) is an auncient citadel locatit on a heich rocky ootcrop abuin the ceety o Athens an contains the remains o several auncient biggins o great airchitectural an heestoric signeeficance, the maist famous bein the Parthenon. ↑ Thucydides 2.15.3: "ἡ Ἀκρόπολις ἡ νῦν οὖσα πόλις ῆν". This page wis last eeditit on 5 August 2015, at 00:17.